Watercolour and pencil on paper of Paeonia whittmanniana var. nudicarpa (peony) by Lilian Snelling. 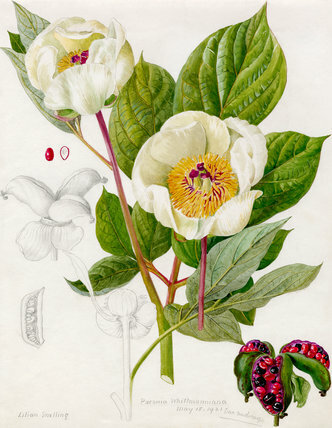 This painting was reproduced in F.C Sterns 'A Study of The Genus Paeonia' published in 1946. The illustration includes dissection views of the seed pods.